Competitionball poly seamless. ITTF-certified *** Premium competition ball. GEWO ULTRA SLP 40+ *** will make the difference! Optimized roundness and careful selection in the pro- duction process for reliable, high quality, roundness and hardness. State-of-the-art production processes and the engineering know-how of German material specialists guarantee the highest quality for your play („Designed by German Experts“). Enjoy a new experience! Design based on cutting-edge technology, made from most recent ITTF-compliant poly material (seam- less). Very good price-performance ratio. Excellent roundness and hardness provide for perfectly uniform bouncing („Optimized Hardness and Durability“). GEWO SLP balls – convincing premium quality! ZEISS 3D Sensor confirms excellent quality! The ZEISS COMET L3D 2 no-contact measurement technique is ideal for visual measurement of easily deformable materials, e.g. table tennis balls. The GEWO material experts asked independent ZEISS en- gineers to carry out thorough measurements – with impressive results. 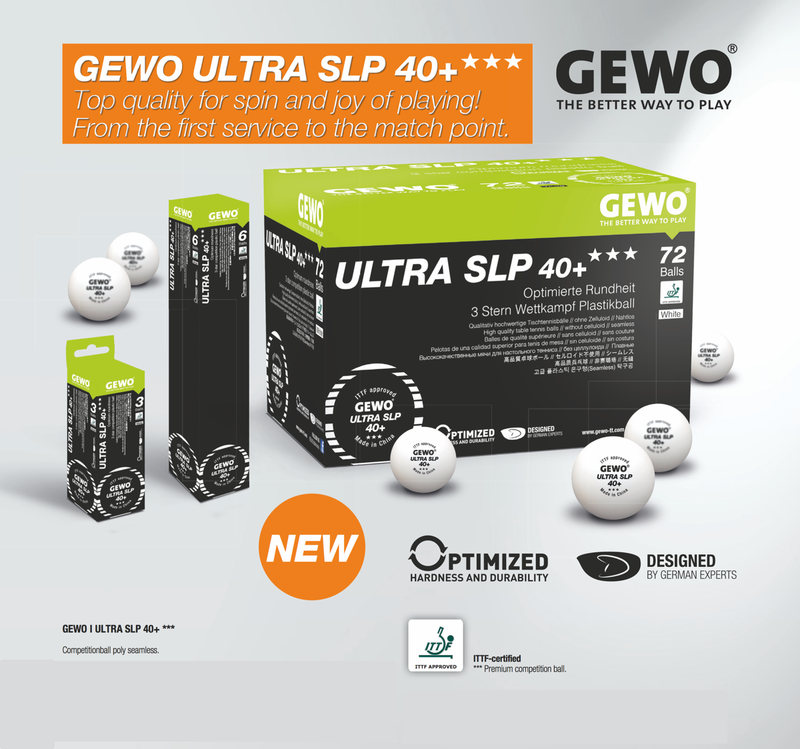 Seamless GEWO SLP balls for best performance. The GEWO SLP balls were measured and tested for perfect roundness and compared to other brands and balls with seams. Minimum deviations guarantee perfect playing characteristics. The marginal difference in diameter of the balls is also impressive. The diameter of all the GEWO balls tested was in a range between 40.32 mm and 40.36 mm (ITTF permitted range: between 40.00 mm and 40.50 mm). The maximum geometrical error ranges from 0.08 mm to 0.14 mm. What are the special features of the GEWO SLP * ball with uniform wall thickness? The ZEISS Metrotom 800 computer tomograph also proved that the quality of the ball is way above the average. The mean deviation per ball is 0.08 mm – that’s thinner than hair. Check it out! Next ›Why are the Cornilleau outdoor tables so durable?